Last week the weather had been perfect, and we were itching to get out of town. 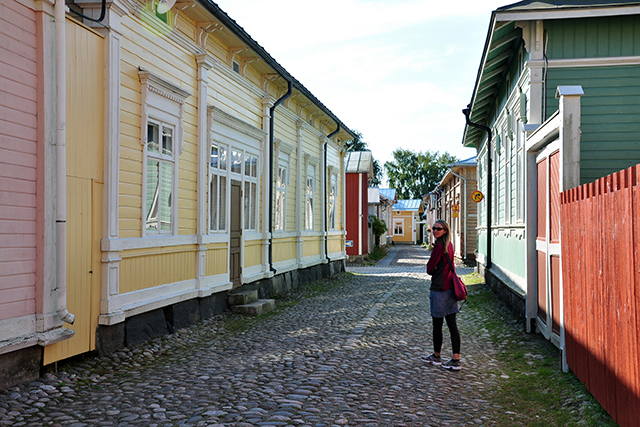 A family joke is to make a note of UNESCO World Heritage site visits, so when initially researching day trips in the area, I came across Old Rauma and I knew I had to go. The old part of town is listed as a World Heritage site and is (probably) easily accessible from Turku on the bus. Well, we didn’t take the bus for reasons I’ll explain, but we did make it to Rauma and I am soooo glad we did. Old Rauma is literally the cutest old town I’ve ever been to, hands down. As a bonus, there is also an old church with medieval illustrations just across a little stone bridge from the main square, which was bustling with a farmer’s market on Saturday morning. But really the town is the major attraction. It is incredibly charming and really lovely to just wander around. There are shops and a few museums (which we skipped – weather was too nice) and it isn’t too touristy. Even with the UWH listing and tourist groups, it certainly didn’t cater to the tourist trade and felt pretty authentic. Something to note though, since they don’t cater to tourists, most of the shops close at 2 on Saturday. We did have a delicious salad lunch on the square. 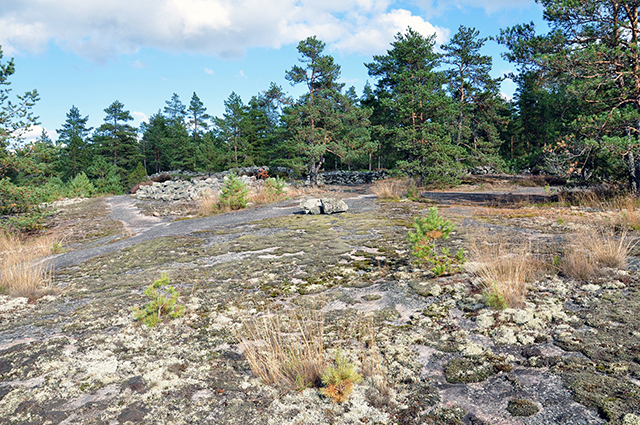 Sooooooo the reason we didn’t take the bus to Rauma is that we wanted to see some piles of rocks in the middle of nowhere. 🙂 The bus was going to cost the both of us 20 euros round trip, so 40 euros total. (Note: The Omni bus goes there for much less, but only later in the afternoon and the times weren’t optimal for us). After some last minute investigation, we found a rental car from a place right up the street from us (vs. trekking out to the airport) for 60 euros. So for 20 additional euros, we were able to go to not just one, but TWO Unesco World Heritage Sites in one day! Only 20 km/20 minutes down the road from Rauma is Sammallahdenmäki, a Bronze Age Burial Site. Yes, which equals a bunch of piles of rocks in the middle of nowhere. But it was really really cool. Again, the day couldn’t have been better – no wind, perfect temperatures and we basically had the place to ourselves. We parked (somewhat confusingly, though there are signs) and grabbed a map from the unmanned info station and then we just wandered off. The reviews on Trip Advisor complained that there wasn’t too enough information at the kiosk and the site (1.5 km total) doesn’t have enough signage. But that is what I actually really liked about it. You could just wander around, discovering the burial piles and let it all soak in – these are 3,000 years old. 3,000 years ago people were in the spot I was able to wander around and they were planning, working, worshiping, loving, dying…it was really amazing. I thought that the extra 20 euros was worth the trip. 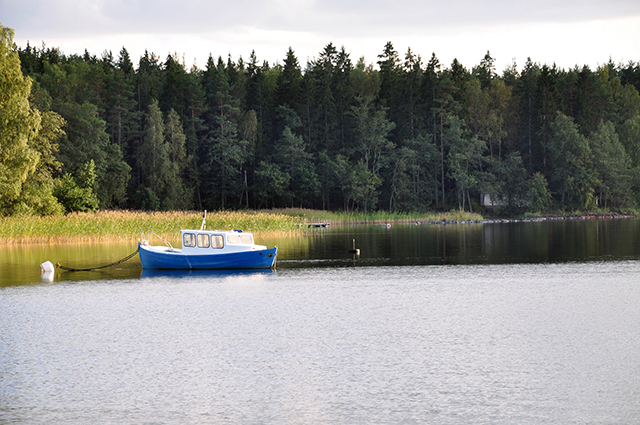 Sammallahdenmäki is hard to get to by bus, and would involve a 5km walk from the town of Lappi. Plus if we didn’t rent the car, we wouldn’t have been able to just randomly turn off the highway and head out to Pyhäranta. Rural Finland is gorgeous. Like really really gorgeous. More pictures on Tim’s flickr! Posted in Day Trips, Finland on September 15, 2015 by Sarah.